Review: Alien movies are always the same. The aliens invade, and we attack back. But in this alien story we have a new weapon, Sherlock Holmes. 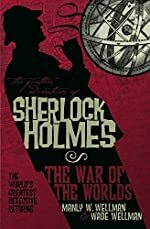 In The War of the Worlds by Manly and Wade Wellman, Sherlock Holmes, along with his sidekick Dr. Watson, joined by Professor Challenger, lead the way to survive this alien invasion. Trust me; this won’t be like regular alien movies or books. This is only one book in the Further Adventures of Sherlock Holmes series that has been rereleased by Titan Books. There are five parts to this book. In the first part Sherlock finishes a case and receives a mysterious egg. When he and his colleague Prof. Challenger look carefully at it they discover its true power. It is like a web-camera to an alien settlement on Mars. They study it for awhile then reports come of strange activity on Mars, and then a strange pod lands near London. In part two, it tells of Sherlock’s whereabouts during the invasion, including a scene where he encounters the person who lost the egg to Holmes. Part three and four tell of Prof. Challenger’s and Watson’s whereabouts during the invasion. Challenger and his wife travel to a bay to escape to France. His wife boards a ship when the aliens come in tripod walkers. One naval ship blasts two of the three, but gets destroyed. It proves the aliens aren’t invincible. Watson joins up with Holmes and Challenger at Baker St. They observe the egg and discover the aliens feed on humans by sticking ‘straws’ into the specimen and drinking the blood. When an alien comes, Challenger tackles it and Holmes injects it with a drug. Watson then deduces they die of Earth bacteria. Soon the rest die. In part five Holmes and the others use the crystal to teach the aliens and vice versa. Challenger’s assistant finds the source of the heat ray and has Watson touch it, but Holmes stops him. It would have killed Watson. The assistant is really a criminal. But he took notes from the aliens about impulses that explode atoms. Holmes burns them to save humanity from killing itself. Overall Sherlock Holmes: The War of the Worlds deserves 5 out of 5 stars. First of all because it gives a new twist to alien stories. Also, it has suspense that will keep you reading. The alien’s technology was quite fascinating. The fact that it wasn’t like a full out world war made it easier to comprehend. But, since the alien pods only landed in England, it made it seem less like a usual alien story. Still, it was a good book and I recommend it and the rest of the series to mystery lovers. We would like to thank Titan Books for providing a copy of The War of the Worlds for this review. Have you read The War of the Worlds? How would you rate it?